Our wonderfully soft and fluffy chenille throw is the perfect choice for your bed or sofa. Available in a wide choice of colours, whether you wish to continue a neutral colour scheme, or add a vibrant touch, you are sure to find the ideal throw to suit your room. Lusciously soft with a fluffy feel, this stunning chenille throw features tassel ends, fantastic for adding extra depth of texture to your home. Snuggle up and get warm with this chenille throw, perfect for keeping you cosy on a chilly night.Our wonderfully soft and fluffy chenille throw is the perfect choice for your bed or sofa. Available in a wide choice of colours, whether you wish to continue a neutral colour scheme, or add a vibrant touch, you are sure to find the ideal throw to suit your room. Lusciously soft with a fluffy feel, this stunning chenille throw features tassel ends, fantastic for adding extra depth of texture to your home. Snuggle up and get warm with this chenille throw, perfect for keeping you cosy on a chilly night.Our wonderfully soft and fluffy chenille throw is the perfect choice for your bed or sofa. Available in a wide choice of colours, whether you wish to continue a neutral colour scheme, or add a vibrant touch, you are sure to find the ideal throw to suit your room. Lusciously soft with a fluffy feel, this stunning chenille throw features tassel ends, fantastic for adding extra depth of texture to your home. Snuggle up and get warm with this chenille throw, perfect for keeping you cosy on a chilly night.Our wonderfully soft and fluffy chenille throw is the perfect choice for your bed or sofa. Available in a wide choice of colours, whether you wish to continue a neutral colour scheme, or add a vibrant touch, you are sure to find the ideal throw to suit your room. Lusciously soft with a fluffy feel, this stunning chenille throw features tassel ends, fantastic for adding extra depth of texture to your home. Snuggle up and get warm with this chenille throw, perfect for keeping you cosy on a chilly night. 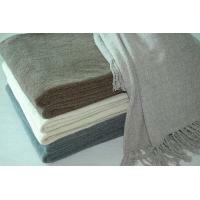 Our chenille throw is extremely soft, warm and fluffy. It is plain weaved with tassel ends. It is the perfect choice for your bed and sofa, fantastic for adding extra depth of texture to your home. Used for bed or sofa cover.